"I’m heartened that at least 2/3 (so far) of the winners of a college-wide student writing contest have elected to take, as their prize, a typewriter rather than an iPod." You can see the machines here. Hi! Yes, you found us! Unless you were looking for the Web Home of Science Fiction Writer Ron Collins or the Ruby language blogging software. Then you might be a bit lost and very confused. Not here, sadly. If you have deep pockets, you can look at Mr. Typewriter or My Typewriter. If you're in the New York City area, maybe Brady & Kowalski can hook you up. If you're fortunate enough to live near a repair shop, I'm sure they have some machines you can come in and try: Tom at Cambridge Typewriter spreads typer-joy, as do the fine folks at Blue Moon Camera and Machine. Or Mesa Typewriter Exchange. A good search engine will be your friend here. Don't discount local, though. Flea markets, church bazaars, yard sales, thrift and charity shops. Typewriters are uncommon until you start finding them. Oh yeah, and that big auction site, but be wary of careful packing. 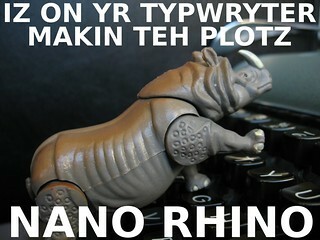 Typewriters are fragile critters. Maybe you're thinking of Richard Polt's "silver surfer" technique? Or just spend some time clicking around the blog links over on the right: lots of us have painted or decorated our own machines. I'm currently taking a hard look at a grubby old Skyriter after seeing this racing-inspired customizing. You probably want to go look at Ted's scans of the NOMDA blue books, which have typeface styles. Sounds like you got in reallly close and read that little number on the typeslug. You've got better eyes than I do. You must mean Maya Stein. Isn't this a great thing? 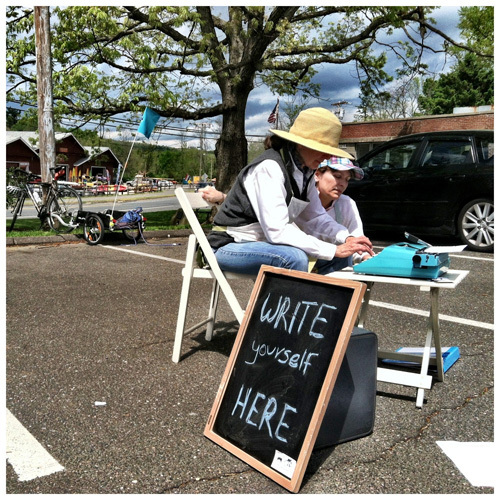 We already know that typewriters like to be photographed out-of-doors, but who knew they liked interstate bike rides, too? Chris is the director of the typewriter documentary "The Typewriter in the 21st Century." He's a nice guy, too, and I'm not just saying that because he ran a microphone up my shirt. Amazingly soft hands, Chris has. And speaking of customized typewriters. I get itchy to buy paint and noxious chemicals when I take a look at these machines. "is probably crap." There, I finished that for you. Little old us once again. Thanks for visiting! Bikes and typers -- a natural combination! I have new reason to go back to Vancouver!